When you think of real estate, you don't often think about the importance of security, but for your real estate website, having a SSL certificate can be important. This is what gives you that little green padlock in the corner of your browser and makes all of your webpages use HTTPS instead of HTTP. SSL literally means Secure Sockets Layer. It provides an encrypted way to send data. Today we actually see a lot of TLS being referred to as SSL, but that is really something for the "techies" to worry about. While I don't think most real estate websites need to really accomplish many of these tasks, you will ask clients to send over name, phone number, email and maybe some other information. It is so easy to setup SSL and provide a layer of security that there isn't any reason not to setup SSL. It makes the whole internet more secure. Google is really excited about making the internet more secure and they have made it clear that websites that use SSL will get a boost in rankings. That doesn't mean that you will go from number 87 on page eight to number three on page one. What I think it means is that you will get a small edge over sites that are not using SSL. If you and your competitor both rank about the same for a real estate search term, Google will give you a shot of Google-juice and put you up a little higher in the search page results. Most of us can really use any help we can get to rank a little higher. What about the warning I see on some real estate sites? This page is warning that attackers might be trying to get information or some other malicious attack. We just saw this on a real estate website. It is usually caused by a SSL certificate expiring, someone typing in HTTPS when the site isn't setup for SSL or something much less nefarious than this warning would lead you to believe. The problem is that "perception is reality". If your client shows up to your site and sees that warning, they are going to high-tail it out of there and go to a competing site to get their real estate fix. You want to fix these warnings as quickly as possible. The main thing you get from using HTTPS is that any information you send is encrypted. When you use a site that is just HTTP, your information or your real estate client's information is sent as text through the internet. That is not good. How much does a SSL certificate for a real estate site cost? Back in the olden days SSL certificates were pretty expensive for normal people. But now with Let'sEncrypt, SSL certificates can be setup on a single domain for free. We include SSL certificates for all our hosting clients at no charge. Some hosting companies charge for it, and that is fine. The certificate can cost between $20 and $100 per year depending on who you host with. We have had clients move their site to us just because of the money they can save on the SSL certificate. How can I setup SSL on my WordPress real estate site? Every site is a little different. Some sites are very simple and just need a few things changed. Most of the time, you will want to change the images, fonts, and other code to use a secure server instead of the old HTTP site they were using. We often see clients who have a lot of widgets, logos, or images on their real estate website that need to be changed from the HTTP to the HTTPS. Once you have switched everything to use HTTPS, then go to Why no green padlock? and run their checker to see what is missing. Sometimes you can fix everything on a WordPress website to use SSL using the "Simple SSL plugin" from the WordPress Plugin Repository. Another great place to test the SSL certificate on your website, for all of you who love to get a second opinion, is https://www.ssllabs.com/ssltest/. 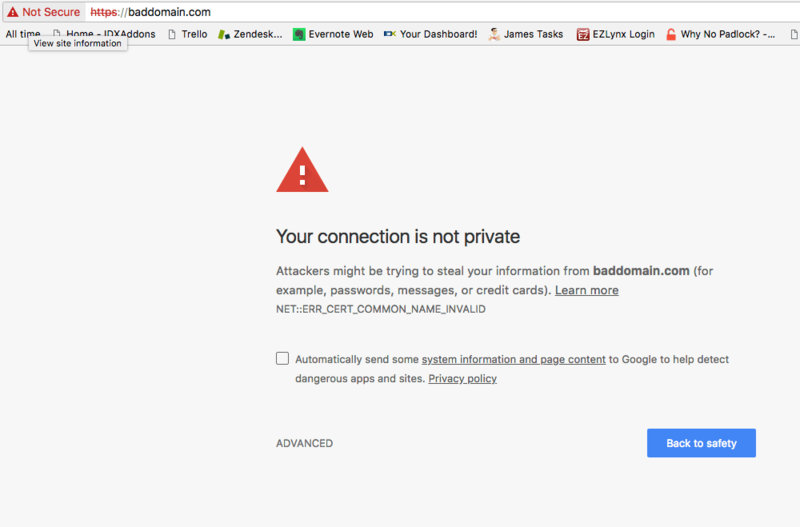 How do we set up SSL for IDX Broker? Once you have a green padlock on your site just let us know and we will update the wrapper on your IDX Broker pages to use the new SSL-enabled version of your pages that has the HTTPS on it. After SSL on WordPress is setup, what's next? Once you have gotten the SSL Certificate setup on your WordPress site, and we have updated your IDX Broker site, you will want to click around on a few links and make sure you see that green padlock and the pages are all loading properly and you can see your real estate listings with their shiny new HTTPS. Then resubmit your site to Google Webmaster Tools and take a look at your Google Analytics settings to make sure that Google knows you have done all of this hard work on your site. We recommend that you resubmit your sitemap.xml file as soon as you can, so Google can give you that little shot of goodness that you were expecting. So remind me, where is the JOY in all of this? Setting up SSL and HTTPS is a lot like buying insurance. It is not as much fun as all of the ads make it sound. But.... the peace of mind you get from knowing that you site is secure, your clients' information is secure, and you have appeased Google (for now) should give you some joy and satisfaction. Sales Pitch: If you want to host your site with us and have us setup SSL on your WordPress site or if you want to use RealtyCandy as your IDX Broker developer partner so we can get you using HTTPS on your IDX Broker pages, just contact us today. Get a free SSL evaluation and video. See what you can do to make your site secure.